Take a look at this great bathroom renovation project in a house in Greenfield Park. You too can benefit from our expertise as a general contractor specializing in bathroom renovations, in addition to our turnkey renovation services. Call us for a free consultation! For this bathroom renovation project, our client wanted to modernize the decor of his bathroom and make it more practical. We worked with an interior designer and an architectural technician to make our client’s vision a reality. First, we partially demolished the original bathroom by removing the vinyl floor, vanity, bathtub and shower. Subsequently, our client wanted a modern bathroom with brightly coloured accents for a successful contrast effect. We also had to do some plumbing work, partly due to the relocation of the bathtub and shower. Subsequently, our team chose a ceramic floor heating system for colder days. We then installed a classic shower with above ground shower tray, with ceramic base and walls and glass doors. Our team then focused on the built-in bathtub, with its grey ceramic support and stainless steel fittings. 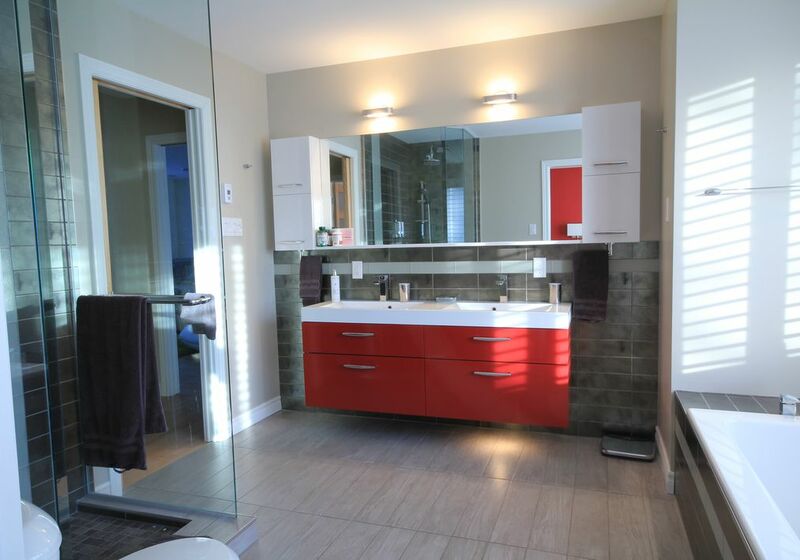 We added a touch of colour to the custom hanging vanity with red melamine drawers and two sinks. The vanity is surmounted by two mirrors, as well as two melamine medicine cabinets and a melamine tablet. Considering the abundant brightness of this bathroom, we opted for lights above vanity, and a embedded light in the shower. As a general contractor specializing in bathroom renovation, we took charge of all the steps of this renovation project. To do this, we have established partnerships with bathroom cabinet and furniture manufacturers, floor covering specialists, electricians, and designers to ensure that each project is a complete success ! If you would like to know more about this bathroom renovation project in Greenfield Park, our turnkey renovation services, our prices, or our other services, we invite you to contact us by email or phone. Your first consultation is free of charge! Our team will be happy to welcome you and answer your questions.